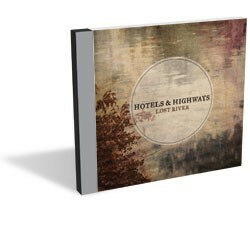 Hotels & Highways’ debut album, Lost River, was born out of an informal, 10-day recording session among friends at a lakeside cabin in upstate New York. It sounds, however, more like the product of a group that had been together for years rather than a mere week and a half. A gleeful blend of country, pop, and rock and roll, the record has a polish befitting the individual members’ considerable professional experience, but its loose whimsy lends the project a casual charm. “Train Whistle” opens the album with driving locomotive steam. It builds from a chugging groove, under the steady gaze of front man/conductor Patrick Thomas, to an open-throttle celebration complete with wailing horns, rumbling piano and exultant vocal blasts. “Work It Out” is next and imparts a sensuous, roots-soul vibe. The playful dynamic between Thomas and vocalist Lisa Piccirillo, a Vermont native, is compelling and dramatic, not unlike Caitlin Cary’s post-Whiskeytown collaborations with Thad Cockrell. Here, the singers are forceful but never overbearing, yielding to the sensitivity of the material when appropriate and commanding attention — from the listener and each other — at the height of tension. Hotels & Highways dim the lights on “Meant to Be.” Lugubrious banjo winds around Thomas’ clear, pretty croon, giving the loping ballad a melancholy tone. Soon, Piccirillo and Thetford native Erin Sidney (aka California-based pop-songwriter Syd) join the singer with bright, aching harmonies. Exquisite vocal work is a hallmark throughout the album, but it’s often overshadowed by equally impressive instrumental arrangements. Uncluttered and unleashed, the three put their remarkable vocal prowess front and center here, dovetailing their harmony lines to propel the song to its jubilant conclusion. The Sidney-penned “Figueroa,” in which the band again favors a vocal-heavy aesthetic, is an album highlight. Sidney also wrote the cheekily downcast “Nothing Hurts Like Nothing,” a countrified complement to his pop-informed musings as a solo artist. Following a minor letdown on the cloyingly inspirational “Live Now,” Hotels & Highways return to form on de facto album closer “Soul” (technically, the last track is a brief, off-the-cuff reprise of “Nothing Hurts”). The rambunctious, R&B-inflected rambler marks an energetic finish to this gripping debut. Hotels & Highways play the Parima Main Stage in Burlington this Sunday, April 10.